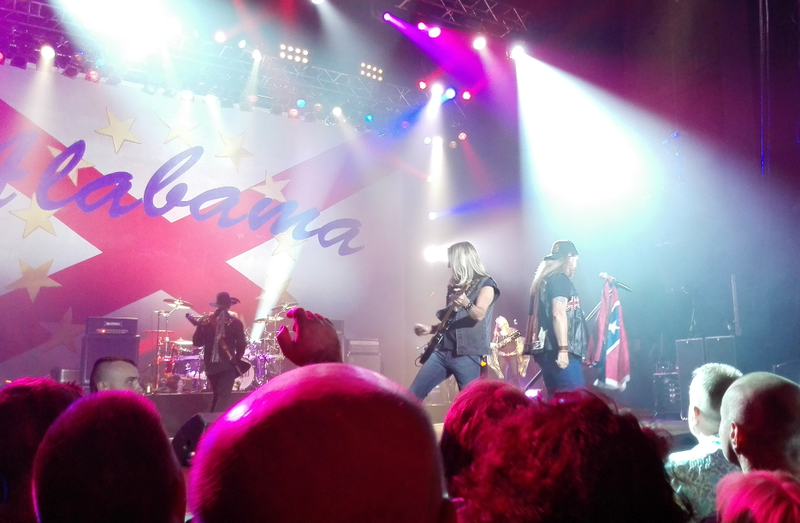 I went to see Lynyrd Skynyrd on Wednesday in Manchester. The day after I received news that my mother had died, in December, I saved Lynyrd Skynyrd’s “Free Bird” to my bookmarks bar – so I could reach it from anywhere on the internet. My anchor. Hotel California was next to it – that had been there a little while longer. I may have contributed two to three hundred views to both videos over the last four months. I knew that The Eagles’ Hotel California had always (to me) represented the death of the ideals of the sixties, the death of “the revolution” and all the rest of it. To my mind, it’s a song about how some people came to the party bringing innocence and were changed by the process they got intertwined with, then one day they wake up and realise the party’s over, and what’s left? What are they without the thing they thought they wanted? I’ve always felt this song very poignantly describes the loss of idealism and the crashing down of reality that eventually (in the UK) birthed both the punk movement and the reactionary new wave music. And before that, the angry young men genre of popular culture (you know, A Clockwork Orange, etc etc). I digress. My point is that I understood why Hotel California was a present and perpetual influence over my emotional landscape. My mum had introduced it to me. Although she’d explained it as “a bunch of people who wake up one day and realise they’re addicted to drugs then they die.” I guess that interpretation was influenced by the way she lived her life. But what about Free Bird? I only heard it for the first time last year, around January/February time. I was re-watching Dharma and Greg and realised that I couldn’t call to mind how the song [Free Bird] went. So I Youtubed it. And in the biggest oversight of my life, I realised I’d never actually heard it before. When my mum died, then, I wasn’t too familiar with the song. I didn’t even know all the words. So why did those mournful chords reach into my heart and resonate so deeply? I couldn’t work it out. I just kept listening over and over again, through the pain and sadness, through the regret and wishful thinking, the “if only’s” and the “why didn’t I’s” and it seemed to calm me, to bring me into the present, to centre me. I can’t explain it. It made me feel profoundly sad and utterly calm at the same time, like it was a dance I knew well. 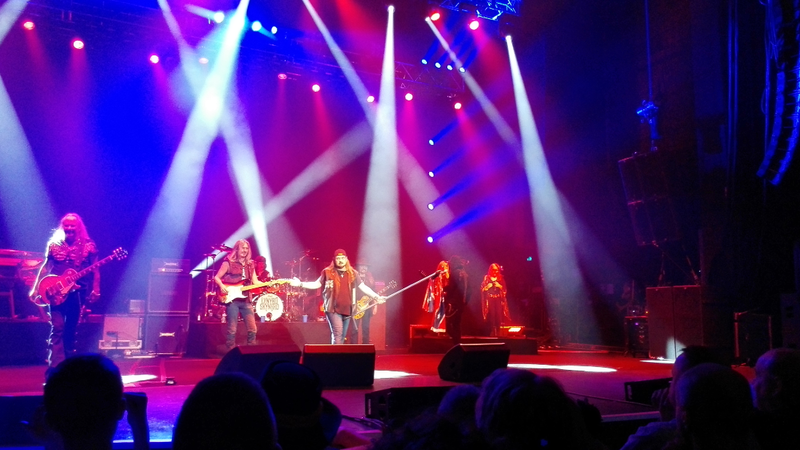 It remained a mystery, even as Lynyrd Skynyrd made it onto my Bands Bucket List, and even as I debated whether £90 for two tickets was affordable. I just knew I had to go and see them. Something was drawing me towards them. This is how, on a school night, I dragged my husband out on the motorway to Manchester and back again, forsaking tea, the night before I had a work trial for a new job, because nothing else was as important as this. I didn’t know why. I was enraptured by the whole set. Rickey Medlocke played the guitar with his teeth. Mark Martejka seemed to be playing his guitar with his charm. I stopped counting after Johnny Colt changed into his third hat of the set; a goggled top hat of the Steampunk variety, superceding some sort of furry animal. Gary Rossington’s black hat was far more rock-n-roll. They did all their big ones – Simple Man, Tuesday’s Gone, That Smell… Someone a little closer to the front than me passed forward an adorable bear who was holding a card. Rather than discard it like any other band would have, Johnny Van Zant personally took it from her, thanked her, and showed everyone what it was before carefully putting it somewhere safe. The level of interaction between the band and the crowd made you feel like this was all just a musical conversation, like you were catching up with old friends who you’d known for your whole life. People you’d want to grab a beer with. I noticed the confederate flag finally made an appearance at some point but I couldn’t tell you when, it wasn’t out for long, and it sat along side the stars and stripes which was out for the whole show. They’re really into their flags – they had the Union Jack out at one point as well, for Simple Man, which was dedicated to the American and British troops. I’ve heard (in the past) a lot of mumblings about associating the Confederate Flag with racism. Well, I’ve only ever associated it with the South and with the Dukes of Hazzard and with Lynyrd Skynyrd. Without getting into historiography, by taking the symbol and using it in this way, they are making it symbolize wholesomeness – the comparative freedom of the South, it’s values and distinctly different culture than that of the North. Perhaps I feel parallels between the American South and the English North. Anyways, we got to Sweet Home Alabama and the band all left. I started to wonder if they were going to play it. The suspense was tense. But the energy of the crowd buoyed me along – they seemed to be in on the joke. I didn’t know at the time that they always play Free Bird for the encore. Anyway, they came back out, and Peter Keys started a little something on the keyboard, and I didn’t really recognize it. Perhaps they were going to play something else instead. Then the tune he was playing somehow morphed into the opening bars, and before I knew it, Free Bird was starting. If I could have saved one moment of my life to relive again and again, I’d choose the next twelve or so minutes. 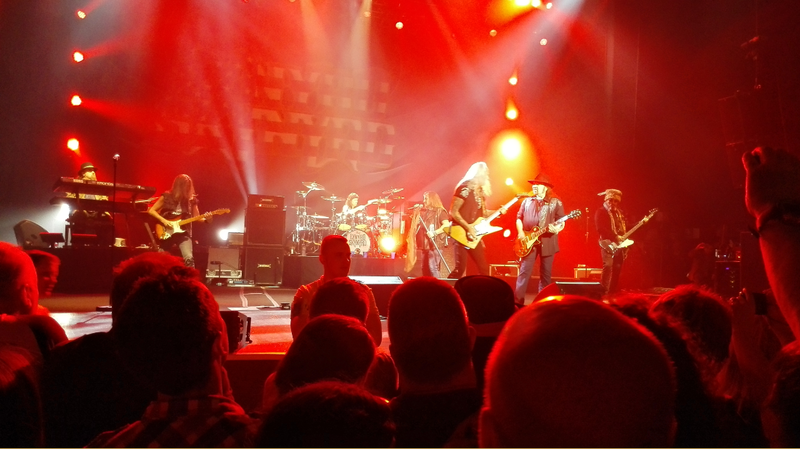 Johnny Van Zant nailed the lyrics (of course), it was just as perfect, no, it was more perfect than I had imagined. During the first chorus I started to cry a little, and I must have imagined it, but it seemed like Johnny had caught my eye, then got misty-eyed himself. I had to pull myself together. The rest of the verses went by too fast, I was hanging onto his every word, to every note, every drum beat. Then the extended instrumental solo started to rise up like a wave. Now, I’m not a surfer, but I think I got a good feel for what it’s like to surf just then. I started to feel buoyed up by the music, I marvelled that there were actual living people in front of me playing a song I’d only heard through my speakers. Michael Cartellone’s drums underscored the guitars that were weaving waves; I got higher and higher… then right at the crest of the wave, there was a light show. I got a little bit mesmerised with the lights on the ceiling (like a cat with a laser pointer) and I was just waving my hands above me and staring at the ceiling feeling like I was on some kind of acid (but I wasn’t). Then it ended. I don’t know how it ended, it just washed away again and I was treading water in a sea of people. Then I managed to get a t-shirt. Having people selling merchandise out in the car park was pure genius to stop a bottleneck. I went home. I let the feelings settle. I was awestruck that those guys do that EVERY. SINGLE. DAY. Just… wow. When they were playing, you genuinely believe that you are the only person in the audience and that they are playing just for you, that you are special and somehow, the world has been a brighter place since then. As I said before, it’s like going for a beer with some longtime friends. If I never get to see another band off my bands bucket list (the bands I need to see before they kick the bucket), I don’t think I’ll feel like I’ve missed out. I don’t think any band I ever see after this could blow me away more than Lynyrd Skynyrd did on Wednesday. I know that lots of bands were being referred to in Terry Pratchett’s Soul Music, but for me, Lynyrd Skynyrd are officially The Band With Rocks In. I was listening to Free Bird again on Friday via my mobile phone, stuffed into the car ashtray for volume, as my car has no sound system, and on the second replay, I suddenly understood why I’d stuck to it. It wasn’t that it felt like a message from my mum to me. It was from me to her. I was the Free Bird. Back in 2005, I told her I wanted to go to university, she took it very badly and tried to kill me (she was in complete denial of some very big mental health problems and, despite the fact she’s always had a personality disorder, she literally wasn’t the same person or people who I’d grown up with – or taken care of since she ended up in a wheelchair when I was 9 years old), and when she failed to kill me, she called the police on me. They arrested me for breach of the peace even though she was the one who was shouting and screaming. When they let me out (no charges pressed, not even a caution, because the desk sergeant knew what she was like), they advised me not to go back. So I had left, I went away, I had to move on because otherwise I was going to die inside like a caged bird. So I spread my wings, I went on my own way, made a life for myself, it was hard having nobody in the world, and I felt awful for leaving, and worried about who was looking after my mother, especially after my sister ended up in a children’s home, and then ten years later, after struggling with anxiety for a year and paying for counselling, the very DAY after my last counselling session when I’d made my peace with what had happened, out of the blue I got a call from my sister who said she’d died of cancer. I went manic for a couple of weeks. Then when I came back down I just felt so bad that I had ever left. I think the line that really made me realise why I’d fixated on this song is “If I stay here with you, girl, things just wouldn’t be the same. ‘Cause I’m as free as a bird now, and this bird you cannot change.” I was always conflicted over leaving but there was no possible way I could stay any longer than I did because I couldn’t keep looking after her. I’d tried to stay, and things hadn’t been like they were before. I hated myself but I couldn’t stay. I had to go out and see everything and do everything and climb mountains and fall off high things and fall in love and protest against fascism and finish school and get a degree and work for minimum wage at 4am and get married and be down and out in a capital city and work as a professional ice skater and learn the ukulele and drive across Europe and go on a train across Europe and eat weird stuff and publish books and lose religion and find it again and lose it again and find it again and go to festivals and be in a film and…………..
And I’m crying as I write this. Because I know that my mum – the persona who was motherly and caring and who occasionally tucked me in bed at night and would tell me a story or pre-set my keyboard with a lullaby, that mum would want me to go and do all those things. And all the other things I’ve done and am doing and am going to do. She would never have wanted to know she was causing me so much pain and anguish by making me stay and physically and mentally abusing me. That wasn’t the same person. And if I’d stayed, I wouldn’t have been able to look after my mum who read to me, I would have been hiding in a box from the mum who I ended up on three categories of the child protection register because of. All through my childhood she was two different people, and one of them I cared so much about and didn’t want to leave behind, not ever. But the other one was nasty, and was just filled to the brim with vitriol and hatred and cruelty. And one day the nice one went away and never came back, and the nasty one got worse than she’d ever been before. And that song is how I would explain it to her if I could. I know she can’t hear me. I always hoped she’d live to 80 and that the nice part would come back one day and that she could be part of my life again and I could make her proud. And instead of feeling so full like it’s going to overflow with the lava of loss and pain and confusion, my heart feels quieter when I hear Free Bird. It’s like someone’s found out how my soul resonates and they’re playing it out loud. I know they’ll never read this, and I know that there are probably millions of people who feel the same way about this song, but it just means so much to me, like no other song I know. Thank you, Lynyrd Skynyrd, for keeping your music alive, and for keeping the band going again after that first tribute in the 1980s. You guys are just so much bigger than the rest of us. I’m so glad I got a chance to see you perform and that I was only four from the front. If anyone else is debating whether to see them or not, just go for it, they’re well worth the time and effort. Oh and the next morning? I got to work on time and at the end of the day the manager didn’t even ask if I wanted the job, they just asked me for my bank details and gave me shifts for next week. And I reckon that if I can get through a housekeeping shift after getting to bed at 2am and getting up at 6am and walking there, then I can probably keep doing this job for at least a little while. Which is all I can ever commit to anything, except my dear husband who I have promised to always come home to, wherever I go to in the meantime.